In 2017, Capital Community College (CCC) will mark its 50th anniversary as Hartford’s first public undergraduate institution of higher learning. With fall classes underway at the start of the 2016-2017 academic year, the college’s advancement office is bringing together an anniversary committee to plan 2017-2018 activities and to commemorate 50 years of an institution that has been an accessible gateway to higher education for generations of city residents. Since the late 1960s more than 300,000 students have enrolled and more than 15,000 degrees and certificates have been granted, according to the Institutional Research office. 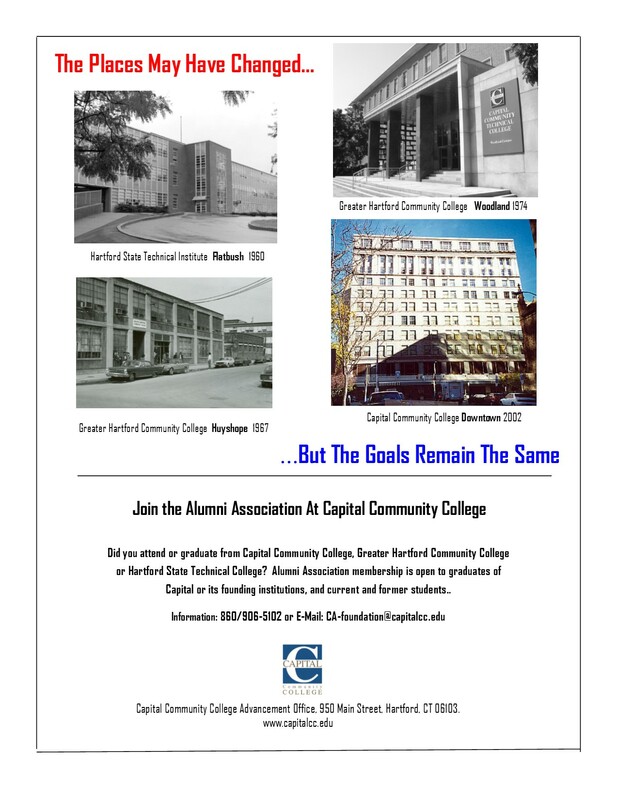 Capital opened as Greater Hartford Community College in 1967 one year after Connecticut established a two-year community college system. A freshman class of 388 students enrolled at a two-story brick building on the east edge of historic Colt Park on Sequassen Street. Led by its first President, Arthur C. Banks Jr., the college grew on its “temporary campus” for seven years. In 1974 fall enrollment was nearing 2,500. The college moved to a six-story building on Woodland Street, the former Phoenix Insurance Company, to accommodate rapid growth and expand into professional programs. In the same year Capital was established Hartford’s technical institute on Flatbush Avenue, founded in 1946 as the Connecticut Engineering Institute, granted its first technical degrees with Thomas V. Raimondi as its first President. In 1992 the two schools merged in a state-mandated consolidation operating at two campuses four miles apart. At the end of 1999 the former G. Fox & Company Department Store on Main Street was selected as the site for a single campus. In 2002 the Community College opened on Main Street after a top-to-bottom renovation of the retail building that is still revered as a downtown landmark where generations of residents shopped and worked. Today CCC offers 60 associate degree and certificate programs and affords graduates seamless transfer options to four-year public and private colleges and universities. Capital, one of New England’s most diverse campuses, is designated an Achieving The Dream “leader college” for its programs to reduce achievement gaps of high-need, first generation students. Major employers in insurance, health care and government are within walking distance of a campus adjacent to a revitalized public transit system and major highways. Occupying a landmark building that once was New England’s largest department store, CCC is neighbor to acclaimed art, cultural and historic institutions that provide opportunities to extend classrooms into the city and its neighborhoods. Honoring the accomplishments of founders, alumni, students, faculty and staff during the 5oth anniversary year will demonstrate the positive difference Capital continues to make in the lives of its students and the vital role it plays in the economic and social life of the community. This entry was posted in Alumni, Announcements, Capital Community College. Bookmark the permalink.